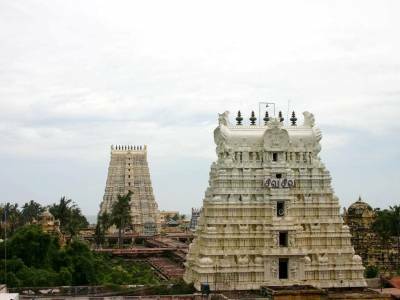 The Rameshwaram Temple or Ramanathaswamy Temple is the most famous destination of Hindu pilgrimage in the Southern India. 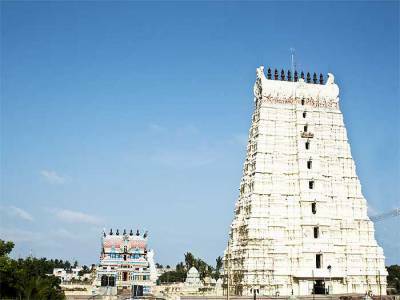 Located on an island off the Sethu coast of Rameshwaram, The Ramanathaswamy Temple can be reached via Pamban Bridge across the sea. The Ramanathaswamy Temple is one of the twelve Jyotirlinga's and is one of the holy shrines of Char Dham pilgrimage in India. Other Char Dham sites includes Dwarka, Jagannath and Badrinath. In Temple, primary deity of the temple is Lord Shiva (who is also known as Ramanathaswamy) in the form of lingam. There are two lingams inside the sanctum - one built by Sita from sand residing as the main deity Ramalingam and the one brought by Hanuman from Kailash called Vishwalingam. 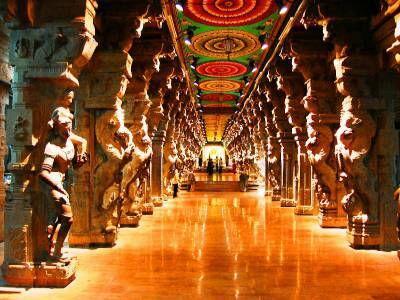 The Ramanathaswamy Temple is an architectural excellence, dravidian style of architecture built in the 17th century. 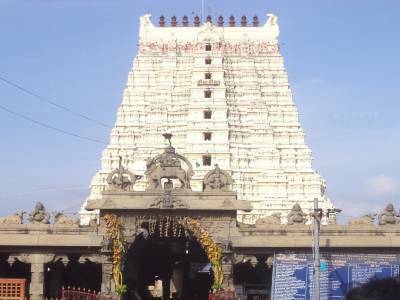 The Ramanathswamy Temple has twenty two Tirthas in its complex, Bathing in these Tirthas is a major aspect of the pilgrimage to Rameshwaram. Ramanathaswamy temple is closely linked with the great epos Ramayana. According to the Ramayana, Lord Rama, the seventh avatar of the god Vishnu, prayed to the god Shiva to absolve him of the sin of killing a Brahmin, committed during his war against the demon king Ravana in Sri Lanka. Lord Rama wanted to have a large lingam to worship Shiva. He directed Hanuman, the monkey lieutenant in his army, to bring a lingam from the Himalayas. When Lord Hanuman was late in bringing the lingam, the mata Sita built a small lingam out of the sand available in the seashore, which is believed to be the lingam in the sanctum. 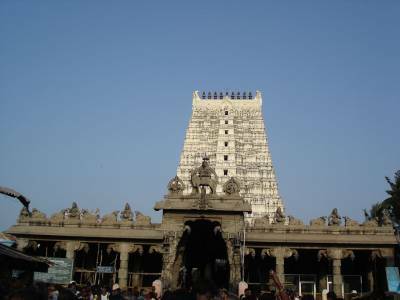 Accessibility: Ramanathaswamy Temple is well connected to Chennai and other nearest cites by road and train. The nearest airport is in Madurai, about 165 kms. Accommodation: There are couples of places to stay Rameshwaram, you will find affordable guesthouses and budget hotels. Get quick answers from travelers who visit to Ramanathaswamy Jyotirlinga.